VA's Own, AVC Headlines their own show, "AVC LIVE"! 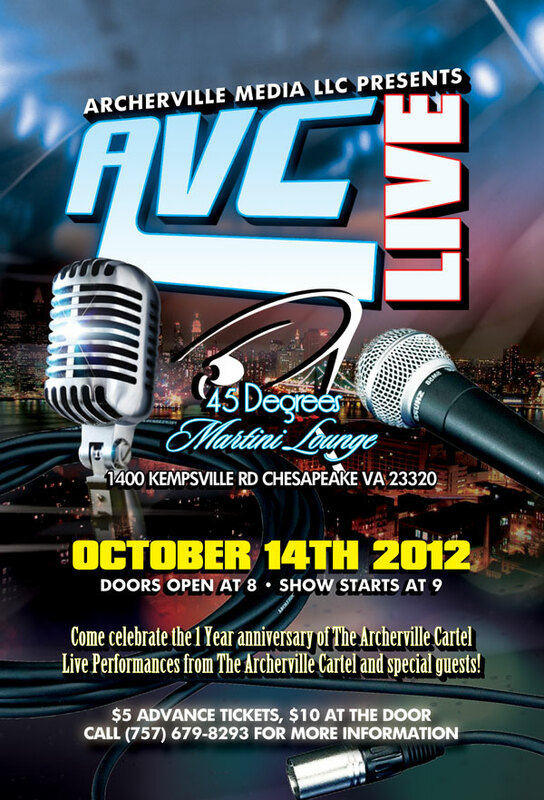 On Sunday, Oct 14th, Archerville Media LLC Presents "AVC LIVE". In celebration of the one year anniversary of forming their group, Klazik & its tha Koncept will perform LIVE in an intimate setting during "AVC LIVE". The event will also feature special guests, LIVE DJ and most importantly, HIP HOP! Since their debut in November 2011, the duo has been featured on AllHipHop.com, WKYS, IndieHipHop, Urban Flair UK, For the DMV Only, Po Politikin + more! Their two videos "Tag Team Champions" & "Getchu Some" have garnered over 150,000 hits on YouTube and AVC has received numerous spins over seas. Sunday evening will be a celebration and a toast to the bright future AVC is destined upon. To purchase tickets at a discounted rate, please click the provided link: http://t.co/6KKfd5O. For more information, please call 757.679.8293. For media inquiries, please contact Candice via candice@candicenicolepr.com by Friday, October 12th.